In the construction industry, thorough planning is a key component of success. But even the best laid plans can be delayed by unforeseen obstacles or frustrated by disagreements, leading to a failure to meet the parties’ financial and schedule expectations. Sometimes the only way forward is through legal action. Our construction attorneys understand the realities of construction litigation and surety law. 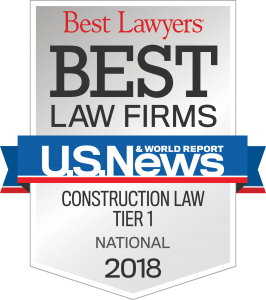 It’s been a cornerstone of our practice for more than 30 years, and our attorneys are leaders in the business – because they know the business of construction. Our lawyers have vast experience in construction law and are experienced in all types of matters that can arise out of construction projects, from single family residential development to large scale commercial, civil and industrial construction. We represent a wide variety of clients in both the public and private sectors of the construction industry. Coats Rose construction attorneys frequently represent the surety industry, providing underwriting and claim advice for a wide range of surety products. In fact, our Firm’s attorneys represented the surety industry in several cases of first impression in Texas. They played a major part in the elimination of so called “bad faith” causes of action against sureties from each perspective: the claimant, the principal, and the indemnitor. Coats Rose construction law attorneys have been instrumental in developing the Texas Residential Construction Liability Act and the Texas Residential Construction Commission Act, participating actively within both to administer claims in residential construction. When legal action stands between you and a successful project completion, our attorneys will find a successful resolution and get your business moving again. We’ve done the same for clients in all Texas courts and 25 other states. University Health System SkyTower and Robert B. Green Campus Hospitals – San Antonio: Created all the contract documents for the new hospital tower and also the new downtown campus hospital. The construction program spanned over 4 years and will total nearly $900 million dollars. Minute Maid Stadium- Houston: Arranged contract procurement. Worked on disputes involving construction and management services, and construction litigation. George R. Brown Convention Center- Houston: Handled construction litigation and defense of prime contractor’s acceleration claims, and subcontractors’ pass through claims. Toyota Center- Houston: Handled parking facility procurement and litigation. Represented a rural hospital in a dispute against a major healthcare equipment supplier. Supplier sued the hospital in federal court alleging that the hospital’s award of a contract for medical imaging equipment violated Louisiana public bid law. After oral argument, an evidentiary hearing, court-ordered supplemental submissions by the parties, which included additional evidence, the Judge ruled in the hospital’s favor and dismissed the supplier’s complaint in its entirety. Represented a government owner in the resolution of a major scope dispute for the delivery of professional services for the procurement a major health care facility. By using a dispute review board process and developing expert testimony to provide an in-depth explanation of the standard of care in the industry, we helped the public owner quickly reach a settlement that enabled the project to get back on track without ever having to mediate, file suit or engage in costly discovery. Represented a general contractor whose subcontractor installed a defective light pole that collapsed across the owner’s building. The clear cause: a manufacturing defect, not installation. The manufacturer went into bankruptcy. The owner’s property insurer still sued the general contractor (the client) and subcontractor, alleging they were “sellers of a defective product” and strictly liable under Texas law. We got the subcontractor’s insurer to assume the cost of defense for the client, and he persuaded all parties to agree to non-suit of the case to allow early mediation to resolve all claims. We then established the general contractor, as construction manager for the project, could not be a seller, and was not liable as a matter of law. The general contractor client successfully avoided all liability and cost of defense. Represented a large mechanical contractor in recovering most of its contract balance for completed work on a remodeling project for a major internet servicing and data center facility, including a retrofit of the facility’s air conditioning system. The private owner claimed the system, as designed by a third party, failed to operate properly. In fact, the owner had obstructed progress of the work and expanding the scope and schedule far beyond the work originally required. After filing suit on behalf of the contractor, arranging key interview of a key former employee of the owner, and developing a multi-million dollar claim against the owner to demonstrate the bulk of the claimed defects were largely extra work, a settlement was finalized resulting in the client recovering more than 90% of its contract balance, all without taking a single deposition or even having to go to mediation. Arbitration Counsel for EPC Contractor in International Arbitration (Helsinki, Finland) with Subcontractor arising out of the design and construction of two peat fired electrical power plants located in Ireland – amount in controversy approximately 20,000,000 Euros; length of arbitration hearing – approximately 50 days. Successfully defeated the petitioner’s claim in its entirety, and prevailed on our client’s counterclaim for approximately 7,000,000 Euros. Trial Counsel for non-destructive examination contractor in lawsuit with pipeline operator arising out of the remediation of a 31 mile natural gas pipeline in Ohio and Indiana – amount in controversy approximately $60,000,000; case was settled favorably following 5 weeks of jury trial. Successfully represented EPC contractor in International Arbitration (London, England) with owner regarding delay and extra work claims regarding two power plants located in former Soviet Union. Amount in controversy approximately 100,000,000 Euros; length of arbitration hearing – approximately 6 weeks. Successfully handled transactional work for a forty million dollar fast Track Design-Build Minor League Baseball Stadium, involving several private/public partnerships. Design and construction was completed within the 18 months “play ball” deadline. Coats Rose handled the development requirements and all design and construction related contracts, including FF&E, Scoreboards, Seating and other specialized procurements. Drafted and negotiated the project procurement and execution documents for the Construction of a $75,000,000 Performing Arts Center, including CMAR agreement, project consultant agreements and FF&E procurement documents. Provided advice concerning delivery method and RFP provisions for statutory compliance. Advising Texas’ largest school district on construction procurement contracts and issues in relation to a $1.9 billion bond issue for construction and renovation of Houston Area Schools and Facilities. Representing international chemical company in defense of contractor’s delay, productivity and other claims arising out of construction of air separation plant. Representing EPC contractor in a contract dispute involving basic engineering design and front end engineering design services for all process and auxiliary units, utilities, interconnecting pipe and all other facilities and associated integration, including technical assistance services for two premium refineries in Brazil, with capacities of 600,000 BPD and 300,000 BPD, respectively. Representing EPC contractor in a dispute involving alleged defects in the fabrication of refractory for furnaces of a delayed coking unit, and arising from conduct as a procurement agent for owner and as the project manager for the Delayed Coking Facility portion of a Modernization Project. Representing international chemical company in International Arbitration (Monterrey, Mexico) in defense of contractor’s delay, productivity and other claims arising out of construction of air separation plant. Represented an EPC contractor in providing advice and document review of Front End Engineering and Design and Engineering Procurement and Construction contracts, together with the related third party financing documents required of the contractor, for construction of an industrial plant facility incorporating two (2) C3 Oleflex Process units and one (1) UOP Huels Selective Hydrogenation Process unit with a combined production capacity of 1,020,000 metric tons per annum of polymer grade propylene and chemical grade propylene.